This is a small gallery showing construction around downtown Raleigh. Click the photos for a larger image. 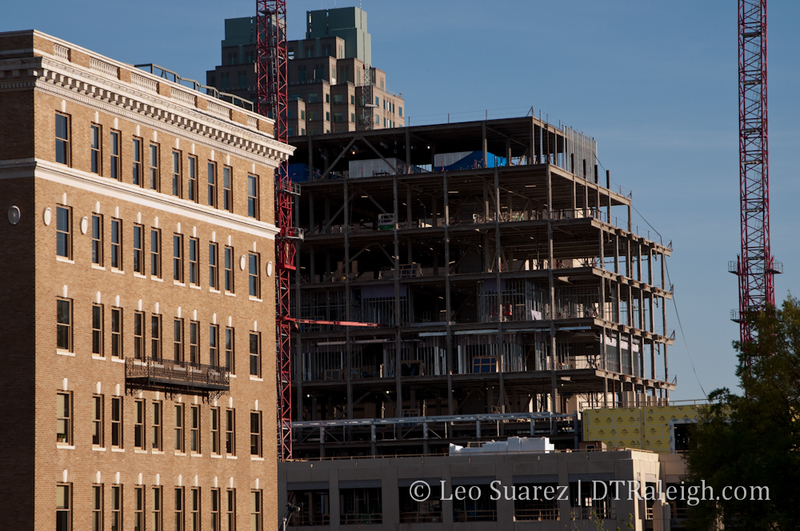 The Justice Center appears to be topped off and is taking shape into the Raleigh Skyline. 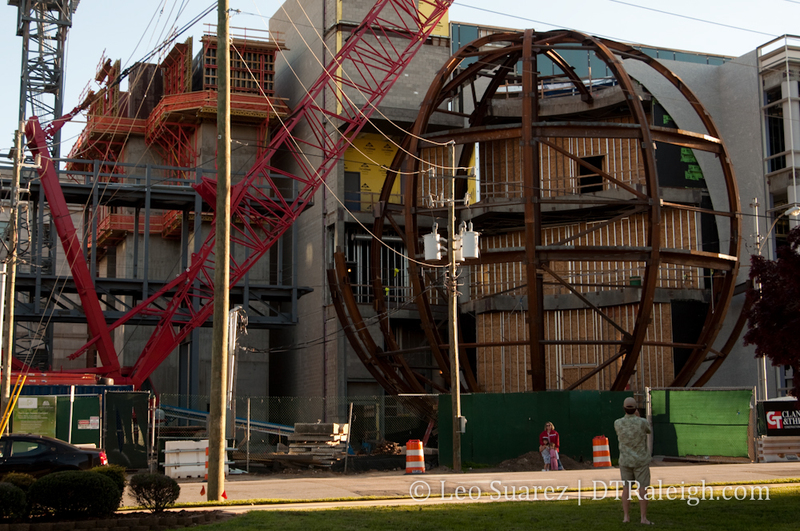 A family poses for a portrait in front of the globe, a part of the upcoming Nature Research Center, now being pieced together. The new AIA headquarters is being built on Peace Street. Next Post → Introducing Municipography! Its great to see all of the construction, even if the Government is funding most of it. 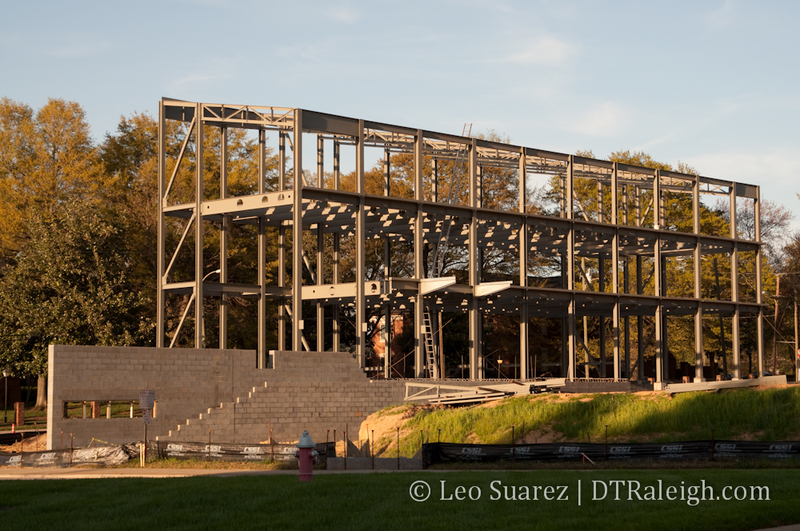 Would have loved to see the Lightner Center coming out of the ground as well! Who thought the sky bridges at the NRC were a good idea? Awful. I don’t get why people are so down on the sky bridges. At least its something different. Might be cool to be able to stand up there and look down on traffic. St. Louis has a Science center with a skywalk over Highway 64/40 and its pretty awesome to stand out there and look down on everything. Its unique and connects the buildings in a functional way…again, I guess I just don’t get all the hate for these things. They connect the structures, they look cool, and it makes the whole thing like an interconnected complex instead of isolated buildings. It also makes an aesthetic “doorway” coming into the city. Well it was a requirement…those buildings needed to be connected. And I’m guessing tunnels cost twice as much to build…if not more.